Equine America Cortaflex Powder is formulated to support every joint in the body ensuring joints stay healthy throughout your horses life. Cortaflex provides the nutrients required by joints to lubricate and maintain elasticity within joint tissue, therefore helping to reduce the impacts of everyday wear and tear. Equine America Cortaflex has proven useful for a full spectrum of horses, including riding club horses, happy hackers and first ponies. Wear and tear of your horses joints will occur naturally as they age, however, this has been increased with the extra demands that we now place upon our horses bodies. Riding on artificial and hard ground is very hard on the joints and can cause abnormal wear and tear, feeding Cortaflex joint supplement helps to redress the balance and support healthier joints throughout the body. Equine America Cortaflex contains both Chondroitin and Glucosamine, both of which are produced naturally by the body to maintain healthy joint tissue. Joint tissue is not connected to blood vessels and receives all of its nutrients through cellular walls, therefore the smaller the molecules the easier they are absorbed into the joints. 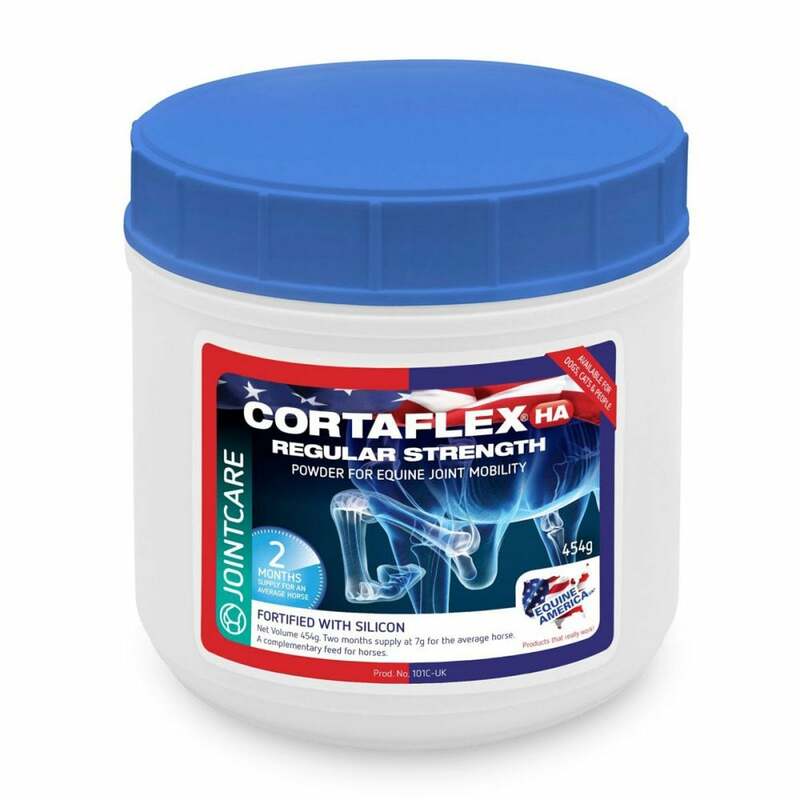 For this reason Cortaflex has been formulated wih micro-sized isolates of Chondroitin and Glucosamine to make them easier to abosrb for greater effect, and to help encourage the body to produce more Chondroitin and Glucosamine to assist in joint repair. Equine America Cortaflex is clinically tested and ideal for feeding on a long term basis to maintain good joint health before problems arise. This Cortaflex is now also fortified with Hyaluronic Acid which helps with the lubrication of damaged joints.